Fantasy Baseball Express: Will the Mets KEEP JOSE Reyes in 2012 and Beyond? 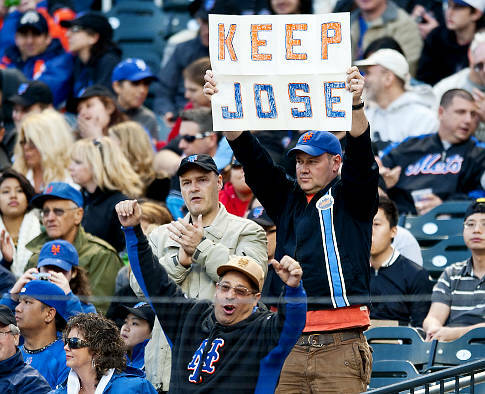 Will the Mets KEEP JOSE Reyes in 2012 and Beyond? Even if The Fantasy Man can recognize a bad situation when he see's one. The New York Baseball Mets need to re-sign Jose Reyes simply because there's no player out there to replace him and play the defense and hit triples the way Jose does it! Simple as that. You want to complain about his legs, past injury problems, or the fact that a six year deal puts Reyes at an age where he might not be as effective with his legs as he is now, then go ahead. But, you and I both know that Jose Reyes "is" the Mets! So as a baseball lover, I created a way for New Yorkers, Mets fans, and Jose Reyes fans to show their support for Jose and make Mets brass want to re-sign but also let Reyes know that you want him back. I found this photo on the Internet! I love it! I love that guy's face at the bottom! Check out the website at http://www.keepreyes.com/ where you can support through http://twitter.com/KeepJoseReyes and also grab a KEEP JOSE Reyes t-shirt! Get the blue tee here and the white tee here!